Japanese and European cover art for Smashing...Live! Art for the insert from Nintendo Power magazine. Smashing...Live! 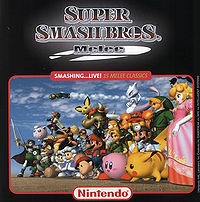 is the official soundtrack of Super Smash Bros. Melee. The soundtrack consists of fifteen arranged tracks, some of which are medleys containing more than one song in each; the total running time is 61:53. 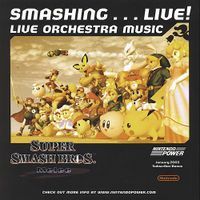 The album was performed by the New Japan Philharmonic; the album was recorded while the ensemble was playing live, making Smashing...Live! among the few soundtracks for video games that doesn't feature songs ripped directly from the game. At the end of every track (sans "Jungle Garden"), the audience applauds the ensemble; in the track "Rainbow Cruise", the audience also claps to the beat of the song once it "loops". A cough (possibly coming from a small child) is faintly audible near the beginning of "Fire Emblem". It was released in Japan on October 21, 2001, a month before the game's release in that region. In January 2003, it was given as a gift to subscribers of Nintendo Power and Official Nintendo Magazine; these releases were the only ones of their kind in the American and PAL territories. This page was last edited on December 2, 2018, at 03:51.